A few months ago it seemed that netizens overall attitude changed a little for talent Nozomi Tsuji. That quickly soured as the mother of three dominated headlines after taking her family on a trip to a farm. Located in a city called Futtsu in the Chiba Prefecture, the farm that Tsuji’s family visited is quite renowned for their delicious and vast strawberry fields. After spending some time picking strawberries the family participated in activities found at your typical farm such as feeding/petting some of the animals and helping milk a cow. Afterwards while uploading the days activities to her official blog and Instagram account, one comment in particular took netizens over the edge. 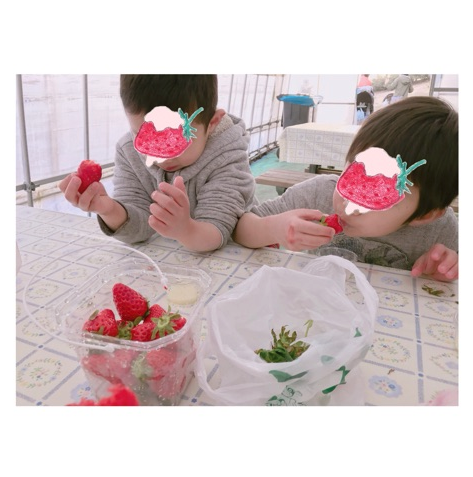 Tsuji mentioned on how she loves to eat freshly picked strawberries with condensed milk. This supposedly harmless comment sent users on various gossip message boards on a frenzy. “It would be way too sweet” ,”You can eat it as it is, why add milk! ?“, “If you truly love strawberries then you will not eat it that way“, were some of the more common comments being spammed about the “issue”. As news started to spread the story was picked up by many mainstream publications on the “riot” that Tsuji caused online, which caused confusion with the general public as to why this was getting so much attention in the first place. The aftermath brought up a discussion on how silly it is for some celebrities to get “beat up” over every single thing they do, with the most highly rated comments condemning the ones who originally criticized her and offering pity to the former Morning Musume member. On some websites for many hours this news was even ranking ahead of Johnny’s decision to lift their ban on online images. This strawberry incident isn’t the first time Tsuji was unexpectedly attacked. In the past she has been criticized for serving too much meat during breakfast, apparently adding too much barley while making barley tea, and the worst crime of all not cutting the green onions small enough while making homemade udon for her family.